anytime. Viewing of the Northern Lights are subject to suitable weather and atmospheric conditions. Terms & conditions apply. Offers apply to new bookings only. villages and visit historic Bergen on what promises to be a magical journey. Geiranger, Norway - Scenic cruising (Sognefjord) - Flam, Norway - London Tilbury. influences reflect both east and west. 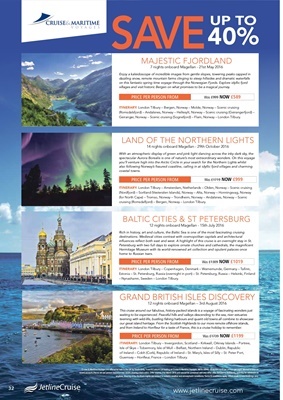 A highlight of this cruise is an overnight stay in St.
- Nynashamn, Sweden - London Tilbury. cruising (Romsdalfjord) - Bergen, Norway - London Tilbury. and from Ireland to Honfleur for a taste of France, this is a cruise holiday to remember. Guernsey - Honfleur, France - London Tilbury.